NEW YORK, N.Y. (Thursday, July 7, 2016) - If it’s summer, it must be time for Kenny Chesney to Spread the Love across America’s breakfast tables -- as he teams with his friends at ABC’s Good Morning America. This Friday (7/8), Chesney will take the stage in Central Park as part of GMA’s annual Summer Concert Series. For Chesney, whose “Noise” is cresting the Top 5 this week, music has been a way to celebrate the elation of being alive. Whether the freewheeling spirit of “American Kids,” the coming of age surge of “Young,” the beauty of women coming into their own in “Wild Child” or the uplifting sweep of “Save It For A Rainy Day,” the 4-time consecutive Academy of Country Music and 4-time Country Music Association Entertainer of the Year understands using music to create a bond with people who’re consumed by living their lives. With Some Town Somewhere moving to Oct. 28 including “Setting The World On Fire,” a special duet with P!NK, the man who scored four consecutive No. 1’s off The Big Revival continues taking his music to the No Shoes Nation with his 14-date stadium Spread The Love Tour. Heading into the halfway mark, Chesney will play Darling’s Waterfront Pavilion in Bangor, Maine then headline the Cavendish Beach Music Festival on Prince Edward Island this weekend. 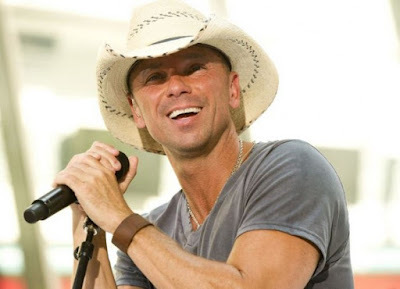 Look for Kenny Chesney and his band tomorrow morning on ABC’s Good Morning America. Their Summer Concert Series airs live from Central Park.